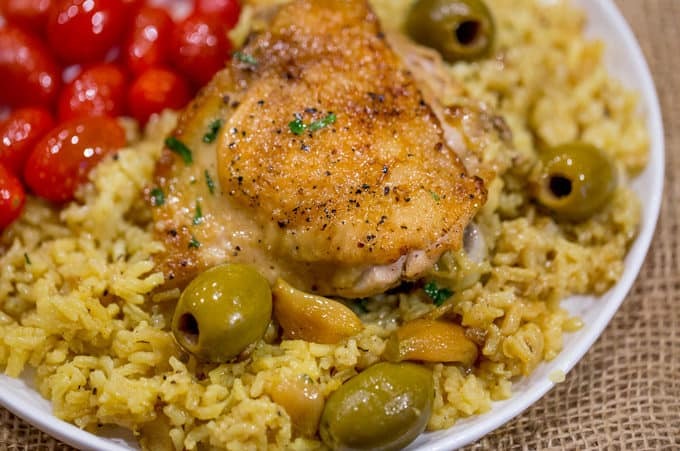 Spanish Olives Chicken and Rice made in a single cast iron skillet is a gorgeous meal made easy with delicious Spanish queen green olives, caramelized onions, garlic and saffron rice. 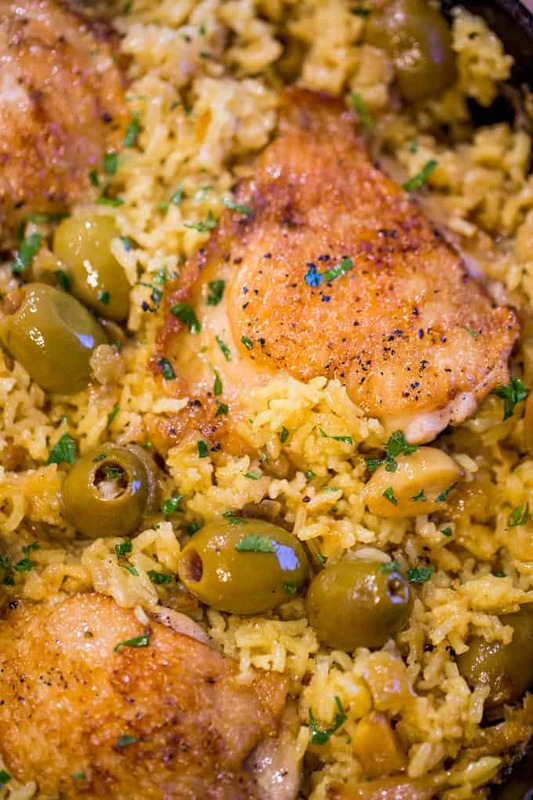 Spanish Olives Chicken and Rice is one of those “that looks super intimidating” dishes that you can make with almost no extra effort over your every day one pot meals. The rice only takes a pinch of saffron, the garlic only takes a couple of minutes in the pan with the onions and low and behold… gorgeous! Today’s post is featuring Olives from Spain who has so graciously sponsored not only the post but a recent visit I took to San Fransisco to an event called Spain’s Great Match to mingle, and learn about food from Spain. I know, pinch me right? I got to spend an afternoon learning about Olives from Spain. As a Californian we grow olives here too, mostly black olives, but we import more than three times the amount of olives we grow here domestically, including these amazing Queen Green Olives that I totally fell in love with at the event! They were dressed with julienned apples, honey and goat cheese and everyone I saw who tried it fawned over them. We tried a number of dishes but these were my favorite. We also learned that the olives are hand picked (serious love involved in doing that!) and that they’re the world’s largest producers of olives (by a pretty wide margin). Fun fact, a green olive just hasn’t turned into a black olive yet. And most olives grown in Spain are used to make olive oil, but the most delicious ones make their way into jars for us to eat. The flavor differences between the olives is pretty pronounced. Black ones are much smokier, but the green olives have a saltier, brinier flavor (perfect for stuffing with pimentos and blue cheese!). I’m team green olive all the way! Add your saffron to your chicken broth. Season your chicken to taste with Kosher salt and black pepper. Add the chicken, skin side down and cook until browned, 4-5 minutes. Add the olive oil to your cast iron skillet and heat on medium-high. Add in the onions and start to cook for 3-4 minutes. Once the onions are mostly melted add in the garlic cloves and cook for 2-3 minutes or until browned. Add in the uncooked rice and cook for a minute. Pour in the chicken stock with the saffron in it. Add the green olives and put the chicken back in skin side up. Bake covered with foil for 45-50 minutes. 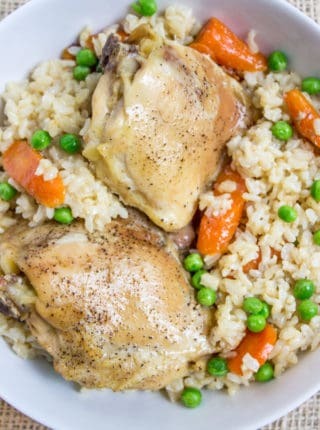 I’d like to make this dish substituting for vegetable stock and omitting the chicken. Has anyone made this as a side dish? Any tips? Long grain or short grain rice? Hoping to try this tonight! I loved this! The olives weren’t over powering, but a perfect salty touch. The only thing I did different was leave our the saffron because I don’t have any. Thank you so much for the 5 star rating! I’m so glad you enjoyed it! This came out perfect! Thanks, this is a game changer! Hello, what does a pinch of saffron look like 6 threads ?? It’s more like 10-12 threads. Can you use chicken breast?? Thanks! Will it change cooking time. 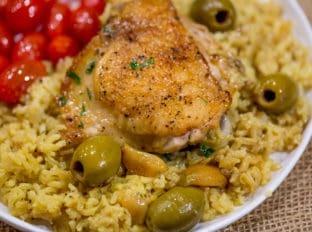 I’m drooling, especially since I recently discovered that chicken thighs & olives are a marriage made in heaven! 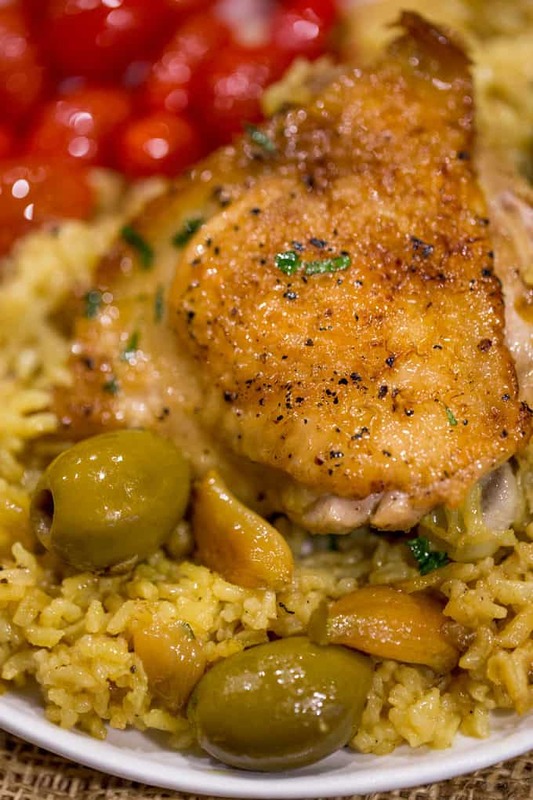 I already made an Italian version of chicken & olives which was ‘delicioso’, but I’m now looking forward to making this Spanish version, which sounds ‘incredible’! As a personal choice, I’ll use brown rice, ….but everything else will remain the same as written in this recipe. Your recipes ROCK, Sabrina. Thank you. Is it possible for you to actually make a video or states the steps of which to add first? I do have it on my list of videos to make but until that happens, you can follow the instruction step by step below the ingredient list. You’re going to start with browning your chicken first. Hope this helps. 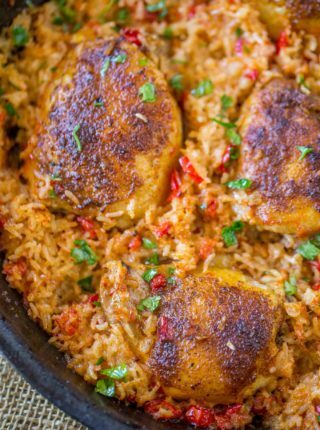 As a novice cook, I have a silly question…is the white rice cooked or uncooked when you add it to the skillet? This looks incredibly flavorful and delicious. I wish my husband was an olive fan but maybe he’d enjoy them in a chicken dish better than on top of a pizza. I’ll have to try this and hopefully convert him. Oh I have a husband who feels the same way! He ate a few of them but left the rest behind for me, but he said he loved the dish! 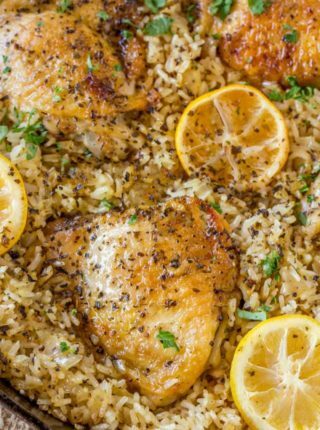 I adore skillet recipes! This looks amazing! This sounds absolutely incredible! I cannot wait to try it! 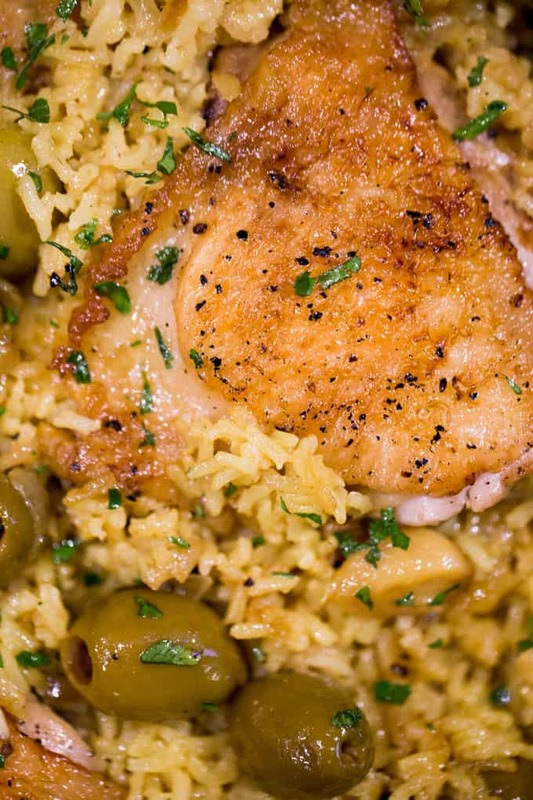 Green olives are my favorite ones, and I love how awesome this chicken looks! 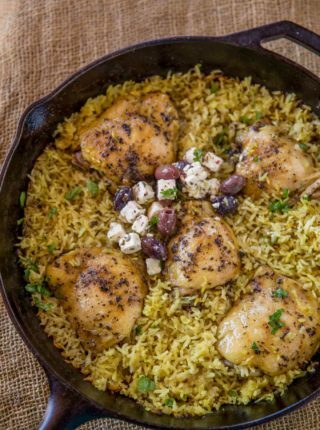 My husband loves olives and I love when things can be cooked all in one pan, haha! So, this sounds like the dish for us! That is one amazing chicken dish! My dad would love this! This chicken dish looks absolutely divine to me! I’m definitely going to be trying it! We have a couple olive fiends here too, so this is perfect! 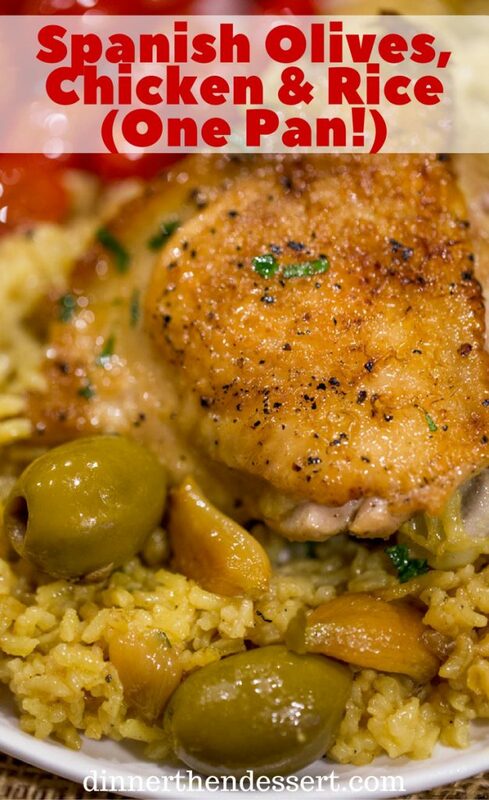 Oh, that lovely chicken and olives. Dinner is served! Your ingredients list shows two HEADS garlic – do you mean CLOVES? Then you say “Bake covered with foil for 45-50 minutes temperature? 350? Yes! Two whole heads! Probably about 15-20 cloves? They are meltingly delicious and muted. Trust me! And yes 350 degrees, totally left that out somehow. Adding it now, thanks for the heads up! Did you use stuffed olives?